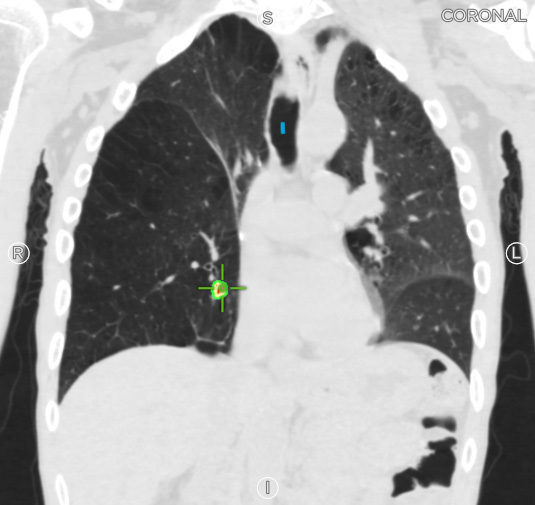 This patient was a 60 year-old male with a previous diagnosis of stage I adenocarcinoma in the right upper lobe (RUL). The patient underwent a lobectomy of the RUL in 2016. 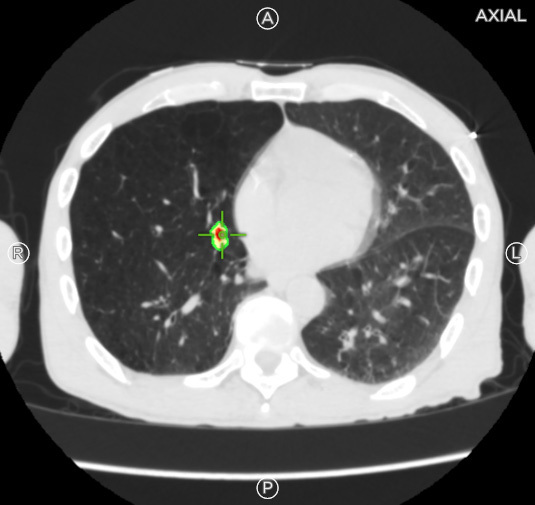 Additionally, the patient was not a surgical candidate due to the prior lobectomy and poor lung function. Dr. Venkat utilized SPiN Planning™ software to segment a nodule located in the right middle lobe (RML). The nodule was 18mm in size and moving 11mm during respiration. 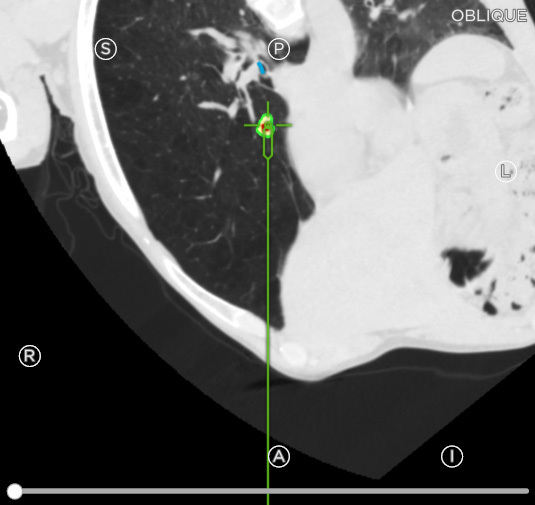 Dr. Venkat opted to use the SPiN Xtend™ Alternate Planning feature to plan an exit point during the procedure since there was not an apparent bronchus sign leading towards the target. The distance between the exit point and the target was 17.9mm. Dr. Venkat started the procedure with navigation. 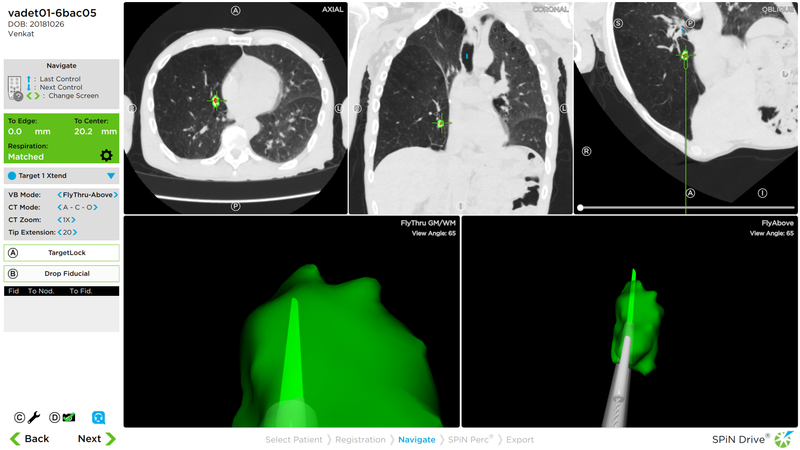 This was deemed a rather challenging case due to the target’s location, movement, and lack of an airway. Despite these factors, Dr. Venkat was able to navigate to the exit point that was set on SPiN Planning™ and aligned the trajectory of the SPiN Xtend™ needle with the target. The first biopsy was obtained with the needle set to 2cm. Dr. Venkat then opted to set the throw of the tip-tracked needle to 3cm to obtain additional samples.